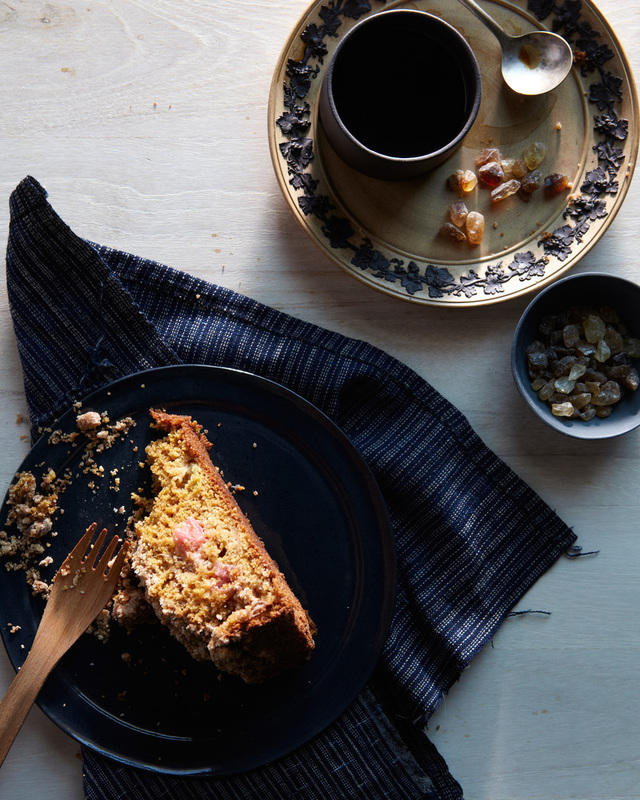 I have always loved a coffee cake. It reminds me of my grandmother who used to make a particular one for me which she sent via the mail! This one is inspired by my love of rhubarb. I made this cake three times trying to get the ratios right. I can confidently now say that it is pretty tasty. The first time I made it I used all whole wheat flour. It was a little too dense and almost a bit bitter. The next I added half whole wheat pastry flour and half white flour and a bit of dried ginger powder. The last and final time, I added more rhubarb and grated fresh ginger. The gorgeous black porcelain plates and little blue bowl in this post were lent to me by the uber talented Marcie McGoldrick.